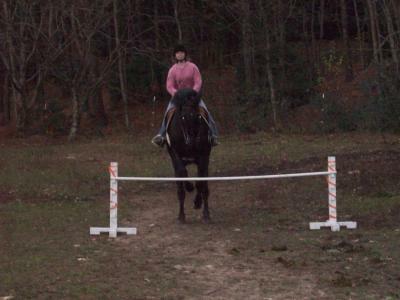 Me jumping my TWH 2.5 ft. I have had a TWH for 10 years and he had mainly been a pasture ornament for those 10 years, and a good one at that. He is jet black and 16.2 hands, a true beauty. When i turned 9 i decided to start riding him, and he was handful especially for a skinny 9 year-old like me. He was mainly a pleasure horse, i had no intentions in showing him. But as the years passed, i started to c potential in him and i was notified that there was a simple local show that was to take place in a few months. I had to change a pleasure into a show horse in a few months! But he had a bad habit that i had to break in order to show. Whenever i rode him we would just gallop across the pasture over and over again. (once again, i had no plan in showing him so i didnt c anything wrong /it)I had to train him to be consistent in all of his gaits and it took a while, but we were finally ready. I didnt know much about walking horses(ima hunter-jumper girl=D) at the time so, i entered him in the w/t and other equitation classes, since there were no gaited horse classes. I want a horse !! It's a TWH, Not a BTW. Lol!! Nice story. Nice horse. i liked the story! u wrote it real well! oh by the way what is a BTW? That's a great story. How long did it take you to turn him around? He looks beautiful BTW.